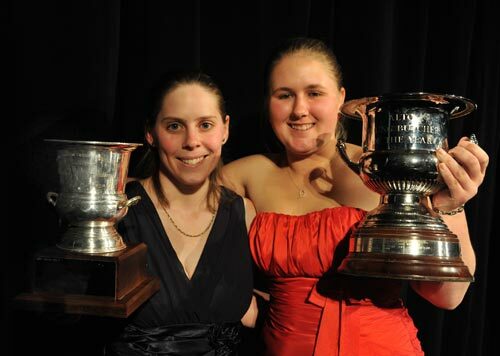 Two talented young women have come out on top to be named New Zealand’s best young butchers. Alesha Ross from Nosh, Matakana won the 2011 Alto Young Butcher of the Year competition held at Sky City last night, while Abigail Smith from Pak’nSave Kaitaia took first place in the 2011 Retail Meat Industry Training Organisation (RMITO) Butcher Apprentice of the Year. The two women, both selected from the Auckland area during the regional stage of the competition, say they are honoured to be recognised for their skills in their chosen career. “I am extremely proud to win and feel privileged to be a part of this competition,” says Alesha, who improved this year on her second place in 2010. Abigail has already set her sights on further challenges, hoping one day to own a supermarket. “I have been dreaming of this for a long time; this win sets the standard for me and helps me achieve my long term goals,” says Abigail. Retail Meat New Zealand Manager, Fiona Greig, says two women taking out these titles speaks volumes about the meat industry and the direction in which it is heading. “It just goes to show even in a male-dominated industry, women can still excel. Hopefully this will encourage more women to consider butchery as a career path,” says Fiona. Along with the other seven finalists from around the country, the women worked tirelessly throughout the day as they were put through an extensive range of practical and theoretical elements. These included a written exam, 90 minute cutting test, interview, costing exercise and a surprise on-stage quiz show run by MC and Quiz Master, Oscar Kightley. Alesha wins a study tour to Europe where she will also attend the world’s largest food fair in Germany, while Abigail heads across the Tasman to learn more about the retail meat trade in Australia. A butcher at the other end of his career was also recognised at the black tie gala dinner last night. The Christie Award, which recognises a lifetime of achievement in the meat industry, was presented to Todd Heller. Mr Heller comes from a family of butchers, rising from his first small shop in New Brighton to being founder of New Zealand’s leading producer of sausages, bacon and smallgoods. The competition, run by Retail Meat New Zealand and sponsored by Alto, Retail Meat Industry Training Organisation, Beef + Lamb New Zealand, Dunninghams, Hellers, Kerry Ingredients New Zealand Pork, Tegel Foods, Wilson Hellaby and Cabernet Foods, has been running for over 30 years. Great to see young women rising to the top in the butchery trade. Congratulations girls! Excellent! I love it when women out do men in male dominated fields. Indeed – I bet it was a surprise to the RMITO – and a wake-up for the ‘boys’ in the competition.